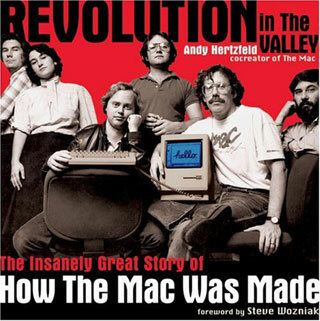 Revolution in the Valley is a new hardcover book, published by O'Reilly Media in December 2004, that is based on the anecdotes from this website. This story describes the book and how it came to be, and what it means to Folklore.org moving forward. When I began to write stories for this site in June 2003, I had no intention of trying to publish them in book form. I was excited by the idea of developing a web site to facilitate collective historical storytelling, where a group of participants could collaborate to recollect an interesting event. I chose the format of numerous interlinked anecdotes because it seemed natural for the web and better suited to a collaborative effort than a single, continuous narrative, allowing a tale to be elaborated indefinitely without compromising the voices of the individual authors. After I got the initial site running in August 2003, with about 20 stories, I began to show it to various original Mac team members and others, to gather feedback and encourage participation. When I showed the site to Tim O'Reilly, I was surprised he suggested that his company publish it as a book. At first, I thought conforming to a book format might compromise my goals for the site, but I soon realized that the site's anecdotal structure could work in book form and I got excited about the idea. After all, I own dozens of indispensable O'Reilly books, so I was thrilled at the chance to become one of their authors. Without showing it to other publishers, I signed a contract with O'Reilly in December 2003, promising a finished draft by June 2004. Tim introduced me to the talented team at his company, including my editor, Allen Noren, who specializes in O'Reilly's more humanistic efforts (his previous two books were Dan Gillmor's "We the People" and Paul Graham's "Hackers and Painters"). Allen guided me through the laborious process to transform the raw material of the Folklore site into a beautiful book. After completing the writing phase in June 2004, we embarked on the editing and layout process. The first step was copy editing. All 90 or so of the stories had to be thoroughly edited, in batches of 10 at a time. Most of the changes involved fixing grammatical errors and punctuation, and removing unnecessary verbiage, chopping up my Proustian run-on sentences (like this one), but they occasionally involved additional writing to provide more explanation or clarification. My editors also wanted to delete many of the most technical passages, fearing they would alienate non-technical readers. After editing was completed on a batch, I had to accept or reject each individual change. I accepted all the grammatically oriented ones, figuring my editors knew better than I did, but I fought to keep most of the technical detail, since I thought it was an important part of the story, although we did eliminate a few of the most technical stories entirely. Sometimes we'd argue about the merits of particular changes, but it usually wasn't that hard to reach consensus. I decided to keep the original text on the site, so you can compare it with the book if you're interested in seeing what changed. The next step was working on the layout. We decided to maintain the basic format of the site, but we divided the stories into five parts at the natural breaking points, to give the reader a chance to rest. We decided to use an unusual form factor, eight inches square, which seems simultaneously large and small at the same time. I was delighted when Allen told me they wanted to print it in full color on high quality paper without increasing the price. Unfortunately, I discovered that it's a lot harder to publish images in a book than on the web. On the Folklore site, I didn't have to worry too much about obtaining permissions, since if anybody ever complained, I could easily remove an offending image. But once published, a book is immutable, and my contract required that I obtain formal rights for every image in the book. Some photographs require multiple layers of permissions (from the subjects, the photographer and the original publication); with twenty year old photographs it's difficult to track everything down. That kind of work is not my forte, but luckily Allen introduced me to a consultant who was willing to obtain permissions for $50 per image. To make matters worse, the printed page still has much higher resolution than a computer display, so we needed to procure higher resolution images than the ones on the site. Before unveiling the site publicly in January 2004, I gathered up my courage and showed it to Steve Jobs. He was fairly enthusiastic about it, but as usual he had some complaints. "I like what you've done with the site", he told me, "but the quality of some of the scans you're using is terrible! Can't you do better than that?" When I complained that it was hard to find pristine copies of decades old material, he suggested that I could probably access Apple's corporate marketing archive to find better versions of lots of the images. I didn't even know that Apple had a marketing archive. It took a few months to track down the right people, since I didn't want to bother Steve about the details, but I eventually found Sue Runfola who works on rights and permissions in Apple's Legal Department, who introduced me to Del Smith Penny, who maintains Apple's marketing archive as a part-time job. The archive is just a single room in a non-descript building a few blocks away from the main Apple campus, stuffed to the gills with maybe 40 long file cabinets. There were stacks of cardboard boxes on top of the cabinets that Del told me were acquired from Mike Markkula's garage, containing marketing material from Apple's first four years that no one had time to examine yet. Some of the material in the archive was indexed in a Filemaker database running on an old Mac, but Del admitted that much of it still wasn't indexed at all, since he barely had time to keep up with the new stuff coming in. But he was willing to help me search for everything I asked him about and by the end of the afternoon Del and I were able to locate a treasure trove of around 30 high quality slides of relevant product and publicity photos, including some that were never published before. We also uncovered a rare video tape of potential TV commercials shot in October 1983 featuring the Mac design team that were never aired, but that's another story. Allen introduced me to Michelle Weatherbee, an award winning book designer who had just hired on full-time to O'Reilly as art director; my book was her first project as an O'Reilly employee. Michelle had me bring up lots of my old Macintosh relics to O'Reilly headquarters in Sebastopol, including my design notebooks, which she borrowed for a few weeks to scan. I worked with Michelle and layout artist Melanie Wang to match the images to the proper stories. Michelle and a few others at O'Reilly helped choose other relevant images from commercial image clearinghouses like Corbis. Allen told me that I needed a foreword for the book and suggested that I ask Steve Jobs to write one, but I didn't have the courage to ask him to do something like that. I suggested Apple co-founder Steve Wozniak instead, who told me that he loved the site and had even contributed a few comments to some of the stories. Woz was enthusiastic about writing the foreword, which he thought he could get done in a few weeks. We told him we needed it by the end of June. I warned Allen that while Woz always had the best intentions, he often was a notorious procrastinator. If he didn't do something right away, it had a tendency not to get done indefinitely. Predictably, the foreword wasn't finished by the end of July and Allen began to send Woz emails to remind him about it every few weeks. Woz always replied promptly, promising to make room in his busy schedule to get it done soon. Finally, in September, while I was meeting with Allen and team in Sebastopol to finalize the layout, he told me that he had some bad news. He had finally given up on Woz's foreword, because Woz hadn't responded to an email informing him the final deadline was approaching, even though he sent it a few days ago. I laughed and told Allen that was actually good news, because not responding to the email meant that Woz was probably actually writing it, and sure enough I was right. A few days later Woz sent Allen an eloquent, stirring foreword that was a perfect start for the book. I assumed the title of the book would be "Macintosh Folklore", just like the website, but while I was working with Michelle and Melanie on the layout, I noticed them referring to the book as "Revolutionaries". I asked Allen what was up and he told me that the sales department didn't think my title was appealing enough, and sales honcho Mark Brokering had renamed the book "Revolutionaries in the Valley", but they were waiting to tell me until they had the cover art finished. I cringed, because I wanted to be modest and avoid hyperbole, but Allen insisted I'd love it once I saw the cover. The next time I visited Sebastopol to work on the layout, Michelle showed me a mockup of the cover, that used a black and white Norman Seeff photo that was taken for Rolling Stone magazine in January 1984, the one where Norman told us not to smile. They had colorized the Macintosh and added a bright red background. I liked the photo but disliked the red color, and was surprised to learn that my opinion didn't matter all that much. The O'Reilly team was adamant, telling me that I wasn't in a good position to judge, since it was supposed to appeal to young people, a group to which I no longer belonged. Eventually they wore me down and today I even sort of like it. At least I was able to get them to change "Revolutionaries" to "Revolution", which I thought seemed slightly more modest. My biggest disappointment with the book has to do with the story links. We decided to keep the story links in the book, even though you can't click on them. To compensate, they were supposed to include the page number of the referenced story, but apparently that was too much for O'Reilly's layout system to cope with, given that page numbers changed frequently as edits were made. I hope we're able to improve this in subsequent printings. Now that the book is complete, it's interesting to compare it to the website. Once I finally got a finished copy of the book in my hands, I was amazed at how much better it seemed than the website for continuous reading, in terms of ease and enjoyment, even though most of the content was crafted for the site instead of the book. Computers still have a long way to go before they match the ease of use of books. The website has some compensating strengths, though, and is better than the book for only reading stories about a particular character or topic. But by far the main advantage of the website over the book is that it's a living document, capable of correcting itself and growing indefinitely. That might seem ironic, given the moribund state of the Folklore site since I finished writing in June 2004. But there's a (somewhat feeble) reason: I didn't want to write new stories while the book was in production, because I knew that I would want to squeeze them into the book, and I didn't want to delay it. Hopefully, this essay helped to shake off some of the rust, and I will start adding new stories soon, probably at the rate of around one per month. You can buy Revolution in the Valley from Amazon by clicking here. Andy, I have the book sitting right here. Congratulations, job well done. I think you got off easy; I've heard of cases where the author becomes such an unimportant part of the process once the editing is done that he/she has absolutely no say in the finished product. So far I'd say this book is a nice reflection of the spirit of this site, you, the group of people and events you're writing about, and the early spirit of the Macintosh. I know the site is and I've read most of what you have here so it's a matter of reading the book and seeing how thigs have been edited. Is there retroactive editing going on? Are you going back and editing the stores here with the good edits from the book? Anyway, happy new year, I hope the book brings you good fortune in 2005 and I will forever value the beta Switcher disk you gave me at Macworld SF so many years ago along with the memory of your excitement to show a group of us what you had done that was so cool. We remember you and your enthusiasm as much as being blown away by Switcher. Thanks. We reviewed this book and the review can be found at http://www.maccompanion.com and is in the January 2005 issue of the magazine. The free issue can be either downloaded in PDF or Flash Paper format. Thanks Andy Hertzfeld, for putting this effort to paper! In fact, Sven Robenspiel, I'm interested not only in the 68k-PPC transition, but in every big project in Apple (the creation of the first PowerBook and the very first iMac, the transition to MacOS X, in future this new transition to the Intel Architecture...). I know, Andy, this site is dedicated to the first Macintosh in history, but... what do you think about a very cool Apple (ex-)ingeniers talking small stories about their work? I think this formula is great, so... why should it be limitated only to the first Mac? Andy, Can I get a signed copy of your book "Revolution"? I can paypal you or send a Money order or I can purchase the book and send it to you for a inscription. I have been keeping my Macintosh collection alive for years and have quite a collection of hardware and software. I have your demo app "bouncing pepsi caps". I also have a 128k, a 512k with HD20, a plus and a classic. I have downloaded as much software and games and can repair the units when memory fails or a 400k drive gets sticky. I write software for credit card machines for a living Don in Scottsdale, Az. Dear Mr Hertzfeld, I've been reading the stories on folklore.org for years and enjoy every one of them. After Mr Jobs' death last week I had been wondering why I felt such an impact, since although I have used and loved Macs for decades, I've not really participated in the iOS revolution at all. I do have a current MacBook Pro and find OS X continues the core Apple aesthetic. Anyway, I realised that my sadness came from the loss of one of my folk heroes from the early 80s, when I became obsessed by the Apple II at the age of 11 and saw my future as working on the Apple III or Apple IV once I could make it through school. It's the Apple spirit of the 70s and 80s which spoke so strongly to me as a kid, and as a result I came back to folklore.org to work through the process of understanding this. I work in a job which is very worthwhile to me, but this experience has motivated me to focus on the things which really excite me and which could make a difference, as you guys did. So thanks, and I've ordered the book. Cheers, Matthew.